Photo provided by the Police Department and River Valley Animal Hospital. Neatly trimmed and cleaned, newly named Brooks enjoys a new toy. What can be going through someone’s mind who will put a dog on a leash and tie it in the woods in cold and wet weather or in any weather? And even worse to have obviously been abusing him for a long time. A couple who were hiking in Stony Brooke Park on Route 75 saw him and called the police, who sent Dog Warden Ryan Selig there. What he found was so cruel on someone’s part. Not only was the dog trapped, but his leash was caught around his leg which was painful, his fur was so matted on his feet that it made it difficult to walk, his toenails were severely overgrown and the mats of fur all over him were covered with frozen water. 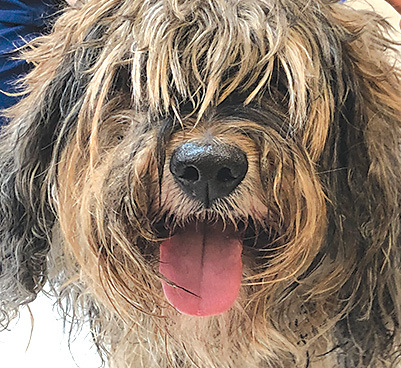 Suffield’s popular survivor is pictured early in his recovery, a very shaggy dog. The dog was taken to the River Valley Animal Center, which is not far from the park. There he was cleaned up and treated and made comfortable. They also discovered a tumor on his leg, which was removed a few days later. Erin Manager has been his chief caretaker, but he is also loved by all the staff and with some of the rooms closed off is allowed the run of the hospital during the day. Dr. Mohan Sachdev said he is a terrier, possibly a Tibetan Terrier. He has been named, appropriately, Brooks. I was fortunate to get to meet him, and he is the sweetest dog. It is surprising how well he seems to be doing after what he has been through. Police Captain Christopher McKee and Dog Warden Selig called a press conference in the hopes that the publicity might help them find who had been so cruel. There were two local TV stations there to take pictures and do interviews, and Brooks loved the attention. You would think he would have seemed a little traumatized, yet he greeted and mingled with everyone. Captain McKee has received so many calls from people who would like to adopt him and also donations of money. These donations will take care of his medical bills and allow the police to offer reward money to anyone who has information leading to who left him in the park. All the requests to adopt Brooks will eventually be reviewed and he will end up in a loving home. Realize though that there is only one family that will get him, but there are so many other abused or lost dogs who are waiting for a home. So, if you are not the lucky “winner,” consider going pound shopping to see if you can find another Brooks. Also think about adopting an older dog. 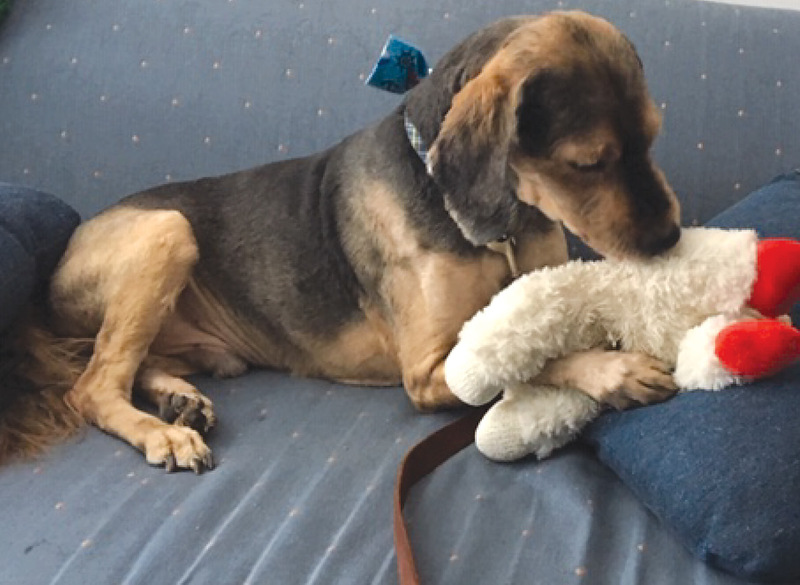 There are advantages to an older dog and some disadvantages such as maybe some health problems, but it can be a good match for an older person. I am an older person and have a wonderful older dog that came from a pound.